For the third and last part of my topic on why bath bombs sink or or float, I am going to talk to molding, shape, and drying time. If you're just stopping by, be sure to read Part 1 and Part 2 of this discussion first! It is true that technique for molding/packing bath bomb dough contributes to “floatage” or “sinkage”. If you pack your dough into a mold as tight as you can and your bath bomb comes out and dries like a cannonball, then it probably won’t float! A real cannonball, not a bath bomb! Remember density! The denser your bath bomb materials are pressed together, the less air pockets there are in between their ingredient particles. 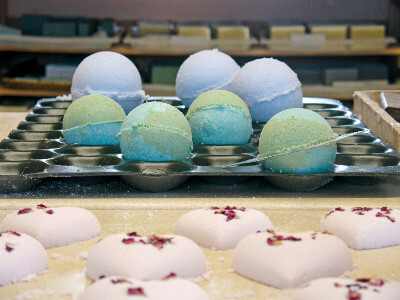 You want to incorporate as much air into your dough and bath bombs as possible, so go gentle on molding. This can be done by lightly sprinkling your dough into each mold half and gently cupping the material with your hand to create a small mound and keep it in place. Do the same with the other mold half and then gently press them together. No Pecs of Thunder…you shouldn’t have to press hard! Lastly, think about purpose and intention. If your bath bomb is not intended to entertain or float, feel free to pack tighter. 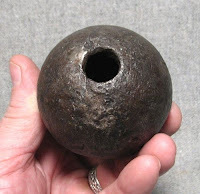 A tighter packed bomb will be sturdier and has the potential to give your user more “bang for their buck”. The shape of your bath bomb plays another part in “floatage” due to water displacement. 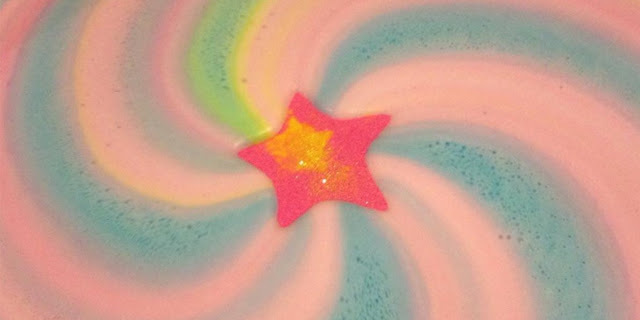 A round bath bomb will displace a smaller surface area in water compared to a flat bath bomb. The larger an object is, the more water it displaces. This also considers density, and takes into consideration the Archimedes principle of why things float or sink, but that is getting really deep. Water displacement principals along with density are why ships that weigh several tons are able to float and not sink. Additionally, a round bath bomb has a smaller, compressed mass in which to support air pockets compared to a flat bath bomb. A flat bath bomb has more surface mass to distribute those air pockets. So, flat, boat-shaped bath bombs have a better chance at floating than round ones. For some reason, there is the expectation that our bath bombs must dry rock-hard within 24-hours of being made and be able to float! I know there are some crafters out there who are able to do that, but the truth is, you will do yourself and your bath bombs a huge favor by letting them sit for a few days to dry. Remember what I said in Part 2 about ingredient density? Oils, water, alcohol, etc. have close-to or the same density as water. When we make a bath bomb, we are trapping those liquids in between the grains/particles of our other ingredients. The bath bombs need time to dry those liquids in order to contribute to those wonderful air pockets. Air pockets gooood! Wet bath bombs baaaad! A wet bath bomb will weigh heavier than a dry one. For example, as an experiment I made a bath bomb that weighed 7.2 oz. upon initial creation. At the end of 3-4 days drying time, the weight of that bomb decreased to 6.7 oz. That’s almost a HALF OUNCE LESS! I know that doesn’t sound like much, but for me and my recipes, I know that a couple tenths-of-an-ounce difference will make my bath bombs sink or float. Another perspective: When Lush makes their bath bombs, they are left completely in their mold for 24-hours to dry before being removed. After that, who knows how long it takes for that bomb to be packed, shipped, stocked, purchased, and eventually used in someone’s bathtub? I’m betting that a Lush bath bomb at its EARLIEST doesn’t get used for at least 10 days to 2 weeks after creation. 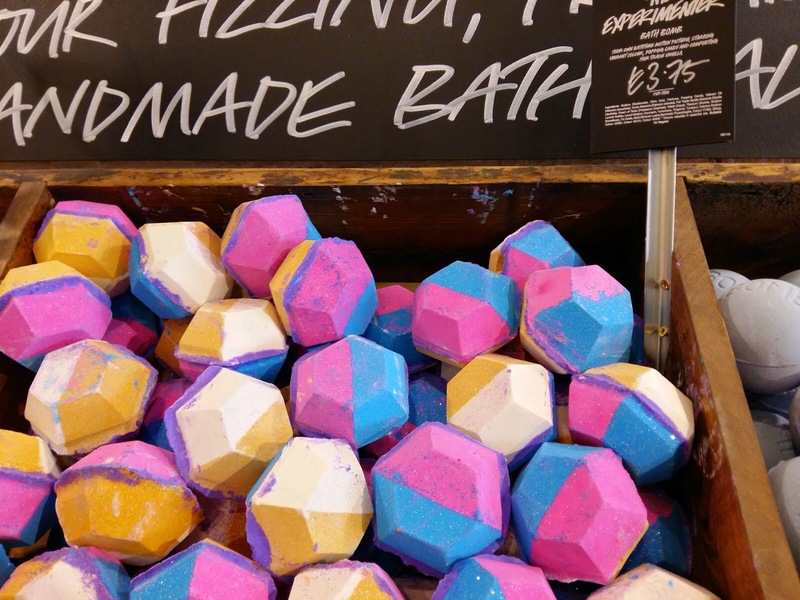 Some of the bath bombs stocked in Lush stores may have been sitting there for months before being purchased. Now THAT’S some drying time! So do yourself and your bombs a favor by letting them sit to dry for a few days before using. Lush bombs...waiting to go home! Well, that concludes my thoughts on bath bomb "floatage". I hope this has been helpful, and I couldn't have come to this point without the hard work and input from the talented bath and body community out there. Keep it up everyone! theoretically, wouldn't it also be a good idea to freeze your bath bombs then too? If you free it then you will cause all that moisture to expand. If you then take it out of the freezer it will melt all of that liquid, hence leaving more "air bubbles" and making the bomb less dense. No, freezing would introduce moisture, which would cause your bombs to react or crumble when they defrosted! This is definitely NOT something you want to do. In fact, many people have been having issues lately during shipping or mailing their bombs to customers, friends or family. Because it's winter, their bombs are freezing during shipment and the person or business receiving them are opening their packages and are getting a mess! Hi Kathy, I've really enjoyed your experimentation with bath bombs, I've just started diving in myself. The hardest part about finding a recipe, is finding one that works for YOU. What works for me in my climate/altitude may not work for you where you live. The best way to figure this out is to start with something like Dean's recipe and go from there.